Looking back, 2014 has been a very productive year for the Friends of Indian River and our community. Through tree plantings, gardens, cleanups, improvements at the park, and maintaining a line of communication with the city, we’ve strived to enhance our community. Your support continues to be essential to achieving the Friends of Indian River goals to improve the quality of life for all the residents of the Indian River neighborhoods. We ask that you continue to keep up this good work by participating in our volunteer efforts, joining us for our monthly guest presentations, becoming a supporting member, and spreading the word. Perhaps the biggest single accomplishment was working with the City to plant 30 trees along the approach to the Oaklette Bridge over the Indian River. These include nine Bald Cypresses and a pair of American Hollies in the median. It was touch and go over the long hot summer, but all of the trees have survived and we can expect them to start thriving over the next couple of years. Of course, we’ve also maintained and expanded our Adopt-A-Spot flower gardens at the four corners of the bridge. We held five major cleanups in the community supporting the Adopt-A-Road program, the Great American Cleanup, Clean the Bay Day, and the International Coastal Cleanup. Overall, our volunteers collected and disposed of about 100 bags of trash from our roads, park, and river. This is trash that would otherwise litter our main street and be washed into the river and bay. We’ve also staying in contact with the city as they work to resolve water utility issues at the Indian River Shopping Center and make efforts to encourage its revitalization. There was major progress at Indian River Park this year. We had another tree planting event at Indian River Park and have volunteers maintaining the new nature trail. The city installed picnic tables, and new fence, benches, an information board, and finished the planned work at the entrance area. 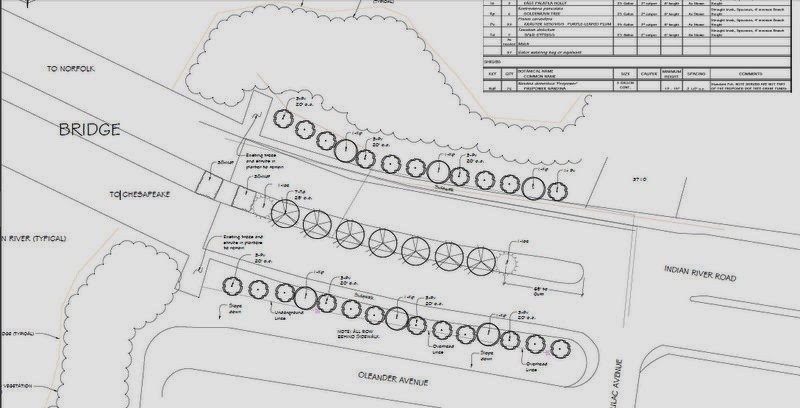 Early next year, our volunteers will install the planned native plant garden at the entrance. And the city is actively explorer a site for a possible canoe and kayak launch along the tidal section of the Indian River. All told, around 40 volunteers performed over 700 hours of service to improve the quality of life in our community. 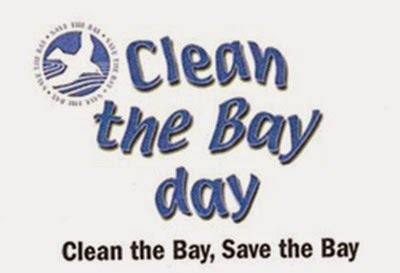 And that doesn’t even count another 20 volunteers who came out exclusively for Clean the Bay Day. Taking a, quite literally, deeper look at the river, a recent water quality report gave the Indian River an “F” due to unacceptable bacterial and nutrient contamination. There is simply too much “poop” and fertilizer being washed into the river. But hope is not lost. We’re seeing more oysters establishing themselves along the river and just this year a local resident videoed a family of river otters playing and swimming in the river. 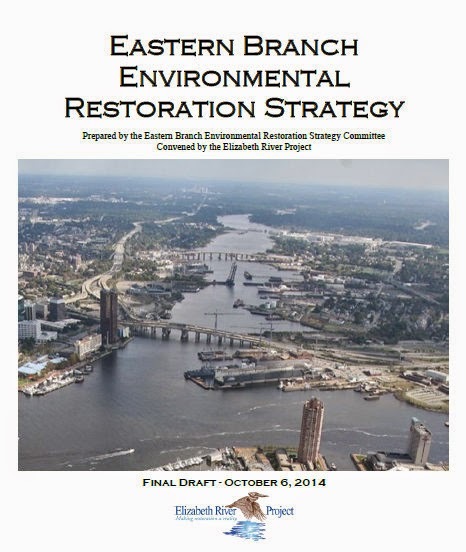 And we’ve been working with the Elizabeth River Project to create a new Restoration Plan for the Eastern Branch, including the Indian River. A similar plan for the Lafayette River resulted in significant improvements that have removed that section of river from the state’s “impaired waters” list. At the same time the Lafayette’s program created a greater sense of community and pride, and we will work for similar results along the Indian River. In the coming year we’ll continue our cleanups in the community, tend to the various gardens we’ve established along Indian River Road and at Indian River Park, trail maintenance, and continue our contacts with the city regarding the shopping center. Our monthly guest speaker program will continue will topics like oyster gardening, composting, urban parks, and backyard habitats. We’ll also work to align our efforts with the Eastern Branch Restoration plan to improve public access to the river and parks, support efforts for natural habitat and shoreline restoration, and help folks take better care of their yards through the River Star Home program. Please join us for our Annual Meeting on January 15, 7 PM, at the Oaklette United Methodist Church, to discuss and provide input to our plans for 2015. We’ll also be holding elections for our board of directors at this meeting. There will also be a virtual “fly-through” tour of the Indian River watershed. We wish everyone a happy and safe New Year. The Friends of Indian River, Inc. is organized and operated exclusively for exempt purposes set forth in section 501(c)(3) of the Internal Revenue Code. In a tremendous burst of activity, the Friends of Indian River, with help from a lot other groups and individuals, logged 180 volunteer hours over the last 2 days working in Indian River Park. On Friday, 20 volunteers from the Friends of Indian River and a crew from Banyan Grove apartments in Virginia Beach, were at the park planting trees and shrubs around the new parking area at Rokeby and Main. The Chesapeake Department of Parks, Recreation, and Tourism arrived early with the native trees, compost, and a water truck to support our effort. The trees and shrubs came from the nursery at the Chesapeake Arboretum, thanks to support from the local Virginia Cooperative Extension Agent, Mike Andrucyzk. The volunteers received guidance from several Chesapeake Master Gardeners and help from a Parks maintenance crew member wielding a powered auger. Through the morning, the volunteers dug holes, carefully planted and watered the young trees, including a screen of Atlantic White Cedars and several Bald Cypresses, the official city tree. Then we started to move around mulch to create neat beds around the new trees. This is only the first phase of efforts around the parking lot. Parks Planner Lennie Luke tells us that over the summer the Parks Department plans to add picnic tables, railing, an information kiosk, and more. In the fall, the Friends will be out there again to finish creating a demonstration native plant garden next to the parking area. There are plans to include our park in a tour of sites during the Virginian Native Plant Society Annual Conference this fall. But we weren't done yet. On Saturday, many of the same volunteers returned to the park to lead the Clean the Bay Day event. This time 40 volunteers – grateful for the new parking area -descended on the park to clean up trash in the park. Volunteers came from our Friends group, the Tidewater Master Naturalists, the Cub Scouts, Centura College, the Kempsville Presbyterian Church, and as individuals, to help find and pick up trash. This annual event, started by the Chesapeake Bay Foundation and supported by counties and cities across Virginia, including the City of Chesapeake, aims to clear the trash that spoils of shores and endangers wildlife. Indian River Park protects the headwaters of the Indian River which flows into the Bay. While the trails in the park are reasonably well kept and usually have minimal litter, over the year a significant volume of litter gets washed down the stream and is spread over the flood plain. Much of this is thoughtlessly discarded bottles, cans, food wrappers, and cigarette butts that are washed in from the surrounding neighborhoods as storm waters wash them from yards and streets into the park. This year our volunteers trudged into the flood plain and pulled out nearly 1000 pounds of trash including all previously mentioned items, several tires, and - winning the prize for oddest item - a 10' kiddie slide. Afterwards, many of volunteers got together to enjoy a well-deserved picnic. We owe a tremendous thank you to all the volunteers who came out over the past couple of days and really over the past year. Without their efforts we could not have accomplished the many projects we've been involved in including the tree planting along Indian River Road, the gardens at the bridge, roadside cleanups, the new nature trail at the park, and several other efforts. Wow, we had a successful week! On Friday, thanks to the cooperative efforts of the Friends of Indian River, the City of Chesapeake Public Works, the Sheriff's Office, and a multitude of supporting agencies, we've planted around 30 trees along Indian River Road just east of the bridge. Fifteen community volunteers who took time off on Friday to make this happen. You can find photos of the planting at https://www.facebook.com/media/set (no Facebook account required). Saturday morning, ten volunteers came out again to participate in the Great American Cleanup. Working along Indian River Road and around the shoreline at the bridge, we collected 18 bags of trash and a tire; about half from along the street and half from around the bridge. Another big Thank You to the the dedicated crew! 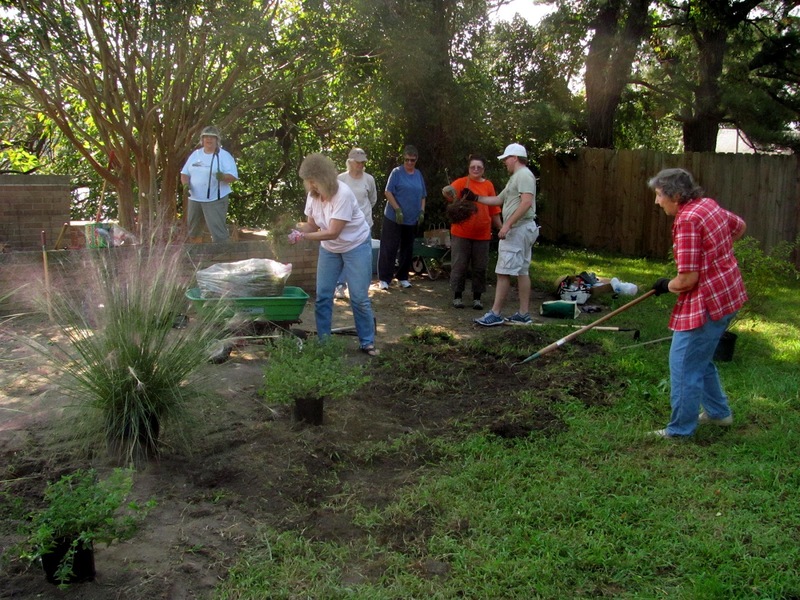 These efforts to beautify our community would not be possible without the dedication of our volunteers. On behalf of the entire community, we extend a heartfelt Thank You to all our volunteers. We have been working with the City to reschedule the tree planting and the best available date is Friday, April 11th. We understand that not everyone can make it on Friday, but at least we'll get it done and give the trees a chance to acclimate before the weather turns hot. We're asking for available volunteers to arrive at 9:30 am, meet at the corner of Lilac and Indian River Road. The work may stretch into the afternoon, so stay as long as you are available; join us later in the day if you are not available in the morning. Please see the original message below for details on what to bring and what to expect on the day of the planting. On Saturday, April 12th, we have an already scheduled cleanup along Indian River Road at 9:30 am. We'll focus our efforts around the bridge and finish any leftover planting tasks from Friday. If you can't make it out on Friday, consider joining us on Saturday. Meet at the side parking lot of the Post Office. We are one week away from our big volunteer tree planting along Indian River Road that we are doing with the City of Chesapeake. Many of you probably saw the city crews out on Friday chopping back the overgrown privet on the westbound side of Indian River Road. This was in preparation for the big tree planting on March 29th. Sometime next week the city will be digging the holes for the trees, which will be delivered on that Saturday morning. We are asking volunteers to meet around 9:30 am, Friday, April 11th, on the corner of Lilac and Indian River Road so we can get everyone signed in and organized into teams. We'll give a demonstration on planting the trees and will have Master Gardeners with us to help show folks how to plant the trees. We hope you can come out and join us. Please wear closed-toe shoes, a hat and bring work gloves. If you can, bring shovels, rakes, and other gardening tools helpful in planting. We will have water and lots of snacks. (We also always encourage folks to bring their own water in reusable bottles to minimize use of plastic bottles). Participants under 18 years of age must have adult supervision. Please park along Lilac Avenue, or walk if you are nearby. We'll be planting about 7 bald cypresses, a few hollies, 6 goldenrain trees, almost two dozen plum trees, maybe some nandina, and if we have enough volunteers doing some weeding in the planters on the bridge corners. We had a nice sized group - nine in total - come out this morning for a pleasant bird walk in the park. We meandered along the new nature trail and then up to the power line cut, both looking for birds and exploring the forest on a beautiful late winter morning. And we did see a variety of birds including a noisy bunch of Crows, many Cardinals and Chickadees, a pair of Mallards in along the river flood plain, sparrows, several Red-Bellied Woodpeckers, a Tufted Titmouse, a Turkey Vulture, a Bald Eagle high overhead, and just maybe an American Kestrel wheeling high above the forest. Immediately afterwards, six of us stayed on to tackle the invasive English Ivy that threatens the forest biodiversity. The ivy chokes out the native plants; no native plants means no beneficial insects which means no food for forest birds to feed their young. Our small team cleared the ivy off of trees covering maybe a quarter acres near the power lines. By clearing it off the trees it both protects the trees from being smothered and prevents the ivy from go to seed berries. A big thank you to the hard working crew. Our next talk at our monthly meeting will be on Thursday, March 13. Chuck Gibson of the Norfolk Master Gardeners and presenter in the CBF VoiCeS training will be talking to us about rain gardens, their beauties, benefits and how to build them. On Saturday, March 29th, the Friends of Indian River volunteers will be working with the City to do a major tree planting along Indian River Road just east of the bridge. The City will have dug the holes and delivered the trees but we'll need lots of volunteers to help plant the trees and shrubs, spread mulch, and get the job done. We hope that many of you can come out and help. On a different note, our group frequently hears about a variety of local seminars, lectures, and other training opportunities concerning nature, gardening and the environment. If you are interested in hearing about such learning opportunities, you can join a new separate mailing list that we are starting. Just drop us a note at info@friendsofindianriver.org if you are interested. Due to the unfavorable forecast for tomorrow, we are rescheduling both the Early Morning Birding Walk and the Invasive Ivy Removal in Indian River Park to Saturday, February 22nd. They will be at the same time, 8:00 am for the Birding Walk and 9:30 for the Ivy Removal. We hope to see you then. But even if we're not holding a walk tomorrow, this is still the Great Backyard Bird Count weekend, so get out there and help with some citizen science. We'd love to hear your count totals, so drop us an e-mail with your results. And, if you are looking for something else to do on a dreary day tomorrow, the Norfolk Botanical Garden is hosting an all day "Garden Seminar – By The Yard" on Saturday with a keynote address by renown ecologist Dr. Doug Tallamy. Registration ($) required, see http://norfolkbotanicalgarden.org/events/garden-seminar-yard/ for more info. And lastly, remember that TFC Recycling Perks' Give Back Campaign is featuring the Friends of Indian River during the month of February. You can donate 20 of your Recycling Points (worth $5) to the Friends of Indian River. See http://www.recyclingperks.com/shop/rewards/5-donation-to-friends-of-indian-river/969/ for more information. Our next regular meeting is this Thursday, Feb 13 at 7 PM at the Oaklette United Methodist Church. We'll have updates on what's going on and an opportunity to sign-up for our various projects - or perhaps propose some new ones. Then Kathy Russell from TFC Recycling will answer all your questions about recycling and what happens to all that stuff you put in your blue bins. This weekend is the Great Backyard Bird Count and its your opportunity to help in some citizen science and see what birds visit your yard. You can also join us for a guided bird watching walk in Indian River park on Saturday, Feb 15 22 at 8 am to see what birds we find there. If we're lucky we may spot some pileated woodpeckers. 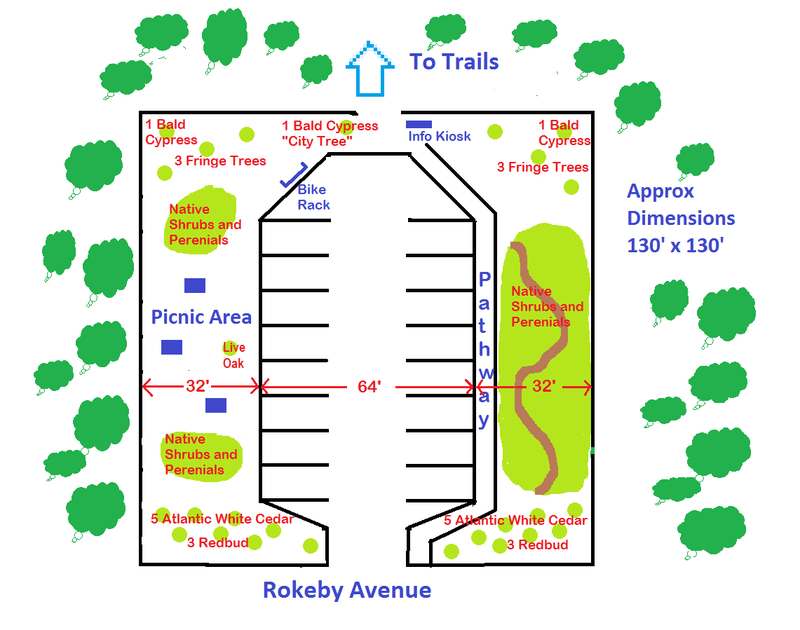 Meet at the park entrance at Rokeby Ave. and Main St. which is located just south of Military Highway, i.e. across Military Highway from the Fire Station. (2001 Rokeby Ave). Immediately after the birding walk, on Feb 15 22 at 9:30 am, we'll rally volunteers to remove invasive English Ivy in the park. We'll mainly be cutting English Ivy that has grown up trees. This will prevent the ivy from creating fruit and creating new outbreaks in the park. Please wear closed-toe shoes, a hat and bring work gloves and other items that may be useful. We recommend long pants and long sleeved shirts. We'll have water and a snacks available. Participants under 18 years of age must have adult supervision. Bring pruning clippers, loppers, screwdrivers (which are amazingly useful in prying ivy off tree trunks) and/or pruning saws if you have them. Again we will meet at the park entrance at Rokeby Ave. and Main St. which is located just south of Military Highway, i.e. across Military Highway from the Fire Station. (2001 Rokeby Ave). You may participate in either or both activities on Saturday. Mark your calendars .... on Saturday, March 29th, the Friends of Indian River volunteers will be working with the City to do a major tree planting along Indian River Road just east of the bridge. The City will have dug the holes and delivered the trees but we'll need lots of volunteers to help plant the trees and shrubs, spread mulch, and get the job done. We hope that many of you can come out and help. TFC Recycling Perks' Give Back Campaign is featuring the Friends of Indian River during the month of February. You can donate 20 of your Recycling Points to the Friends of Indian River. See http://www.recyclingperks.com/shop/rewards/5-donation-to-friends-of-indian-river/969/ for more information. In other news, representatives from the Friends of Indian and Norfolk Highland Civic League met with the City Manager last week for an update on the Shopping Center. There is still no closure on getting the new market; the Economic Development department is cooperating with the center's owner in his continuing negotiation with the "major national retailer" and Family Dollar. In the meantime, Economic Development is also trying to expand the options for the site by contacting other national grocers who are looking to move into the region. The other major issue is the water supply for the area, and on that front the City is very actively investigating the steps necessary to replace the water from the Aqua Virginia well system with City supplied water. We expect the next update in about a month, or sooner if there is a breakthrough. Big news - the Elizabeth River Project is extending its restoration efforts along the Eastern Branch, including Indian River. Representatives from the Friends of Indian River attended the first of several planning meeting yesterday to help set goals for the watershed-wide effort. The need for improved water quality - and expanded public access to the river, shoreline, and parks - for fishing, nature viewing, paddling, and ultimately swimming were highlighted. We'll be looking for ways to enable cooperative effort between Chesapeake, Norfolk, Virginia Beach, community groups, non-profits, business, schools, and individual citizens to make our river a better asset for our community. Over 50 participants representing organization across the three surrounding cities attended the kick-off meeting. Hundreds of ideas and suggestions were raised. More meetings are planned and working groups are being set up to identify priorities for Education/Public Involvement, Wildlife Habitat, Water Quality, and Sediment Quality. We'll keep you posted!